Before you delete the account, you might want to export some of the account data. Confirm your decision by entering your account’s password. Please note that after the password has been entered and submitted, there’s no option to restore the account and its data. If you are deleting your account in order to sign up with a different username, you may need to wait a little bit before signing up again, as it may take some time to delete the data from all our databases. 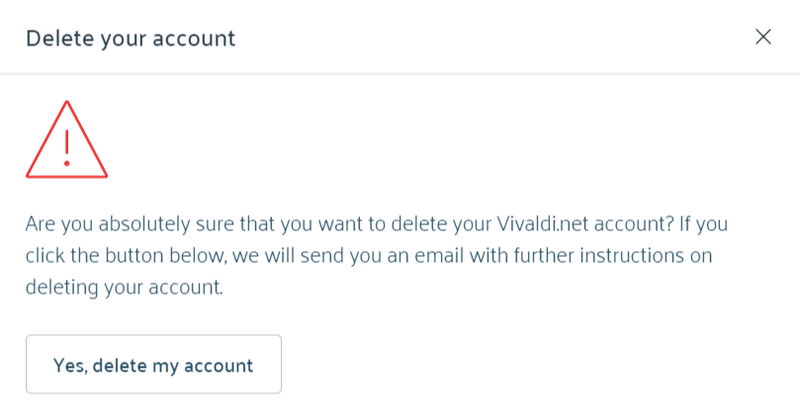 If you no longer have access to the recovery email or have trouble deleting the account, please send us a message on vivaldi.com/contact and we’ll do our best to help you.